So, the much-awaited event of the Fall finally happened today. As expected, we got a completely revamped MacBook Air and two improved iPad Pros for businesses, creators and design professionals. Apple debuted 11.5 inch and 12.9 inch iPad Pro designs in their October event today. Both leaps and bounds ahead of the previous iPad models in terms of body, display, design and specs. Here is everything you need to know about the new and improved iPad Pros. You can find our complete coverage on the MacBook Air from this article. The 11.5 inch display comes with the same proportion and footprint as the 10.5 inch model. The latter 12.9 inch iPad has been remodeled to fit an even smaller form factor than the previous. The Pros are 5.9mm in thickness, chopping down just 1mm from the slightly heavier iPad Pro. For the screens, the iPad Pros are not given a complete edge to edge designs much like the iPhone X which is kind of a buzzkill, but it does come close. The bezels on the iPad Pros 2018 are much slimmer and debut new full-screen displays as well. The removal of the Home button also contributes to the larger view and are the first iPads to be launched without Touch ID. Eliminating the infinity display out of the equation, the iPad Pros do take after the iPhone XR’s quality of Liquid Retina display, the iPhone X’s gesture navigation, and the True Depth camera setup. Also, not forgetting the most exciting addition of all – the Face ID. This one was much awaited to be introduced in the iPads after their massive success in the iPhones. Face ID brings a lot of fun features with itself such as the Animoji, Memoji, amongst others like Apple Pay. To our surprise, the camera for the Face ID and the sensors sit on the top of the bezel instead of the notch – another take on the iPhone X. So, if the iPad is connected with the Smart keyboard, the Face ID will be functional in landscape orientation. Apple, for the 2018 iPad Pros has employed their latest A12X Bionic chip with an 8-core CPU and 7-core GPU. Apple putting their latest iPads on the fast track claims that their CPU integrations will give the new iPad Pros 35 percent faster single-core performance and a whopping 90 percent faster multi-core performance. It doesn’t end here, Apple also boasts that the iPad Pros will deliver 1000 times faster graphics performance. This is a literal game changer! The battery remains untouched and unblemished maintaining the 10-hour benchmark as usual. While Apple clings to Lightning connectors for their latest iPhones, they did shy away from it for their new iPads. Turns out that our suspicions for the USB-C connector addition in the iPads were, in fact, correct. This opens tremendous options of connectivity for the new iPads, for instance, connecting to the 5K resolution display and even power an iPhone. Another impressive upgrade is massive 1TB storage. Again, seen for the first time in the 2018 iPad Pros, that is a jump from the past 512GB. 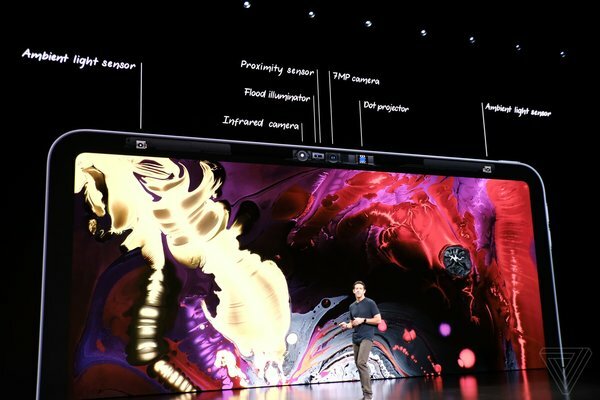 The inclusion of USB-C port, the remarkable CPUs and the outstanding graphics all point towards one thing – Apple is rooting for their iPads to replace computers. While its a truly commendable effort on their part but the iPads still have a long way to go for qualifying from PC ‘alternatives’ to PC ‘replacements’. Both iPad Pro models also feature Bluetooth 5.0 and Smart HDR along with Gigabit LTE, an 18W charging brick but of course the headphone jack was nowhere to be seen. No upgrade is fun enough if it does not come with some exciting new add-ons. So, of course there are some accessories in the mix in the new iPad Pro launch. 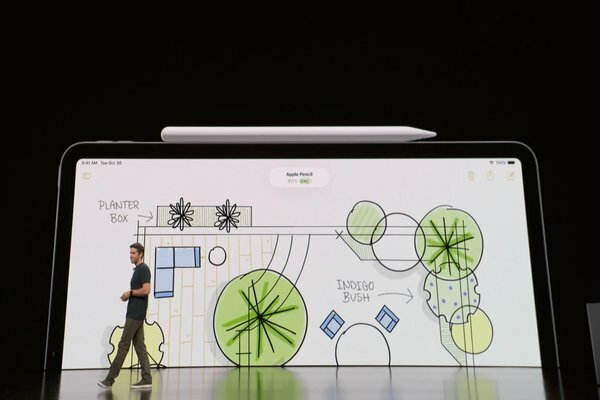 A whole new and upgraded Apple Pencil was unveiled that wakes the device when tapped on the screen and launches Notes. The tap gesture of the stylus is completely customizable with third party apps. Like in Photoshop, a single tap can trigger a zooming shortcut on the canvas. The charging method is pretty cool too and can be powered up by magnetically attaching itself on top of the device instead of having to plug it in the common way. To give the Stylus more balance, Apple has gone for a square cut design as it will be much easier to place the pencil on the iPad with a flat body or any other surface for that matter. The flat edge design coupled with a modern matte finish makes the stylus even easier to hold and use. Speaking of magnetic attachment, the iPad keyboard has been given a major upgrade too. Unlike the previous ones, the new Smart keyboard Folio does not rely on the Smart connector and can work with magnetic attachment to the device. It also has the ability to adjust itself into two different typing angles and is a lot more than just a cover that folds out into a keyboard. The 11.5 inch iPad is priced from $799 (64GB) and the slightly larger 12.9-inch priced from $999. If you choose to opt for the 1TB and LTE with the 12.9-inch model, the cost goes all the way up to $1,899. As for the accessories, Apple has announced that their new Smart Keyboard Folio, Smart Folio, and the USB-C to SD Card reader are available now for pre-order. The Smart Keyboard Folio for the 11-inch iPad Pro would cause a total damage of $179, and the 12.9-inch version runs up to $199. The Smart Keyboard for the 10.5-inch iPad Pro costs $159 and excludes the front and back coverage unlike the newer ones. The Apple Pencil costs around $130. The new iPads are expected to be available sometime before the holidays. November 7th to be precise.